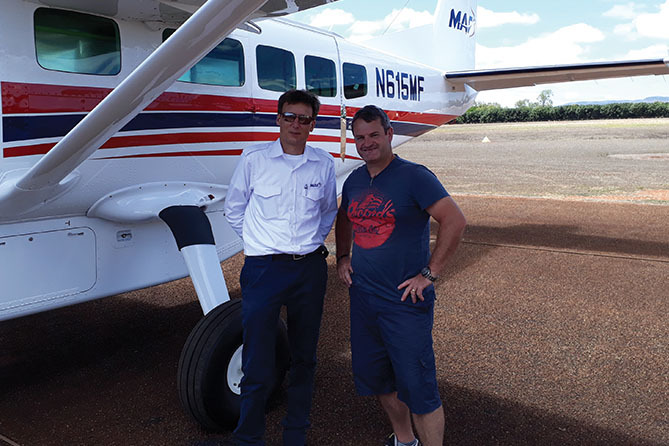 MAF Pilots Simon Wunderli and Christiaan Haak departed on a flight that was out-of-the-ordinary even for them: a multi-day ferry flight from Moundridge, Kansas, USA to Mareeba, Australia in order to deliver the first two new Cessna Caravans for preparation for service in Papua New Guinea. There is always a bit of trepidation when embarking on something that one has never done before. For me, this new experience was ferrying an airplane across endless hours of water. It was certainly not a run-of-the-mill flight for an MAF Pilot. Thankfully, we had the help, knowledge, and support network of experienced Canadian ferry Pilot, Dylan Fast from FastAir to aid us in our preparations. 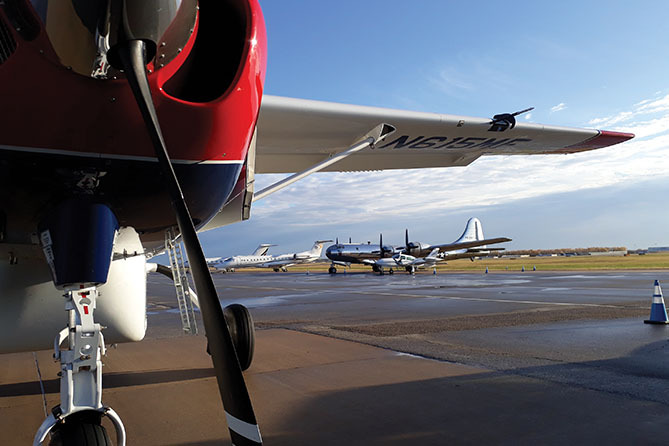 After 24 hours of travel from Australia, where I am based, to get to the other side of the world, I was happy to crash into bed in Newton – a small town just south of Moundridge, Kansas – where the airplanes were parked. The next few days were spent trying to convince and dupe my body clock into thinking that everything was ‘business as usual’. The five days available prior to launching were busy enough: I spent many hours emptying the two planes, taking stock of everything in the pods, and reloading them with a better weight distribution. A good number of shipping boxes that contained most of our emergency equipment were also waiting to be opened. Then the next three big boxes that arrived held all our navigational paperwork. 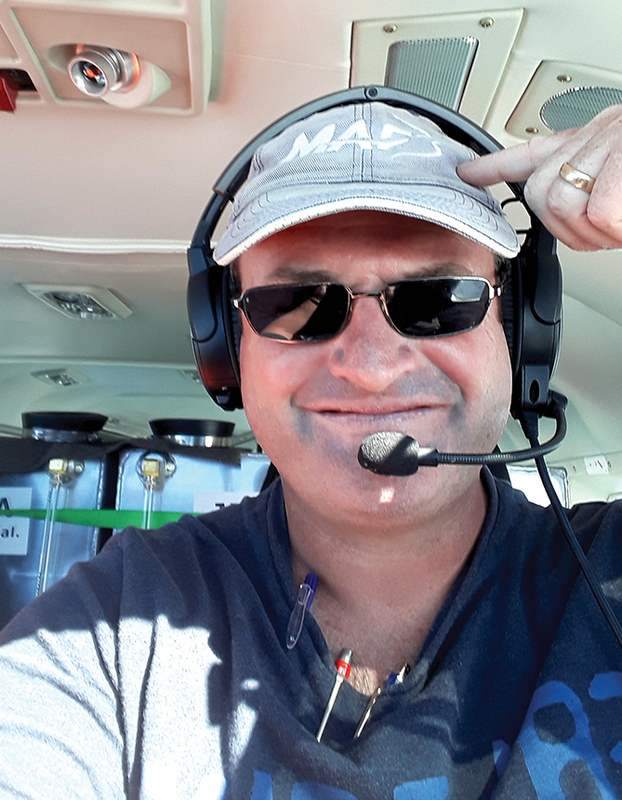 I ended up waiting at the airport a day early to pick up Christiaan Haak, the ferry Pilot for the second plane, because I was off on my dates having crossed the International Date Line during my travel to the United States. I received a bit of a quizzical look when I asked the lady at the airport what the date was! 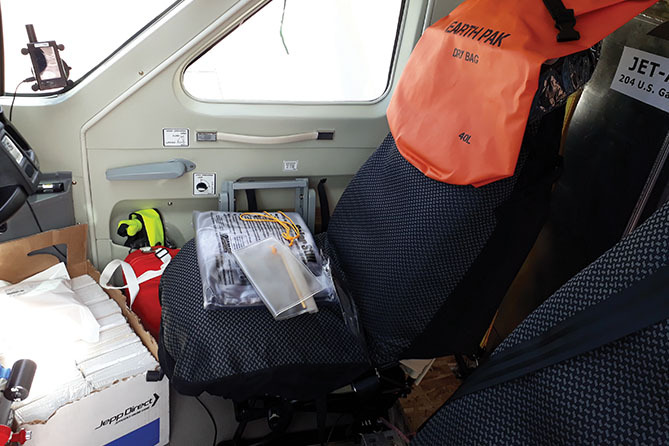 By Saturday afternoon, everything was ready to go after the G1000 flight systems finally received their up-to-date databases for the trip. We had also spent some time getting last-minute items to supplement and complement the emergency equipment that had been purchased. Even though we’d been watching the weather patterns all along, we were now closely looking at what was happening along our 7,500 nautical mile (nm) route in preparation for our departure the following morning. On Monday morning we got up early and drove up to Moundridge where we loaded our personal gear on board the plane and said our good-byes to the great folks at Southwind Global, who had shown us great kindness as we prepared for our trip. 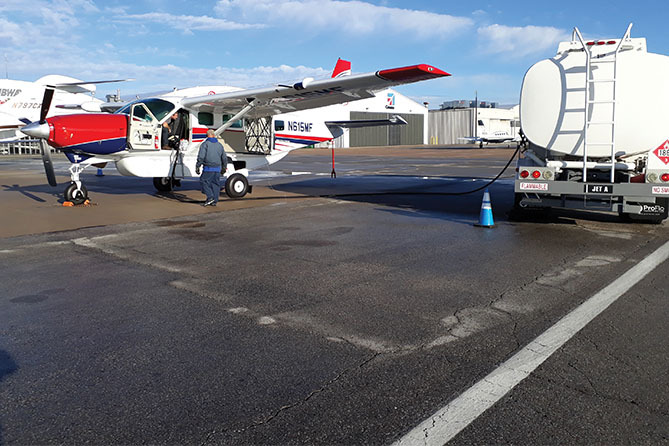 With the break of dawn, we fired up the PT6 engines of our newly minted Cessna 208 Caravans and, with a bit of trepidation and lots of excitement, the throttle was pushed forward! We took to the skies for our first – wait for it – 10 minute flight to Wichita! We first needed to load up a whole bunch of jet fuel and, of course, have a quick look at the Lockheed Constellation parked at Wichita. Our turn-around there was quick and efficient as FastAir had organized fuel releases for us in advance. Within the hour we had picked up our first IFR clearance and were in a slow climb up to 11,000 feet, our altitude that would only vary a little during this first leg when we had to climb to 13,000 over some higher terrain en-route. We enjoyed the simplicity of the FAA system as our flight took us from Kansas through Colorado, New Mexico, Arizona, Nevada and finally into California. As you can imagine the landscape was forever changing, and just as one “wow” was fading the next seemed to form on my lips. This leg of 1,200 nm was also the chance for Christiaan and me to engage with our cockpit and work the fuel system. We had three extra fuel tanks on board, holding between them an extra 1680 liters of fuel, giving us a total flight time of just over 17 hours when including the fuel in our wings. Just as the sun was starting to set, we were given radar vectors that brought us both down for a visual landing into Santa Maria. We finished our post-flight in the dark and left our planes in search of dinner and a bed. The next day we re-fueled the planes and then went in search of a shop that could fill our hand-held emergency breathing tanks. We also made some final purchases and then filed our flight plans for the next leg to Hilo, Hawaii. It was still dark when we arrived at the planes. We finished our pre-flight checks and then jumped into our dry suits for the first leg of our journey over open water. We picked up our IFR clearance and, with just a glimmer of the impending day appearing on the horizon, launched northward into the still dark night sky. Before long, we were glancing back at the receding coastline with the sun just coming up over the horizon. From here on it was blue on blue – blue skies, blue water, and blue GPS screens, (with a lot of white clouds all over the place). We had a steep initial learning curve as we figured out the procedures and made sure that we had the correct clearances and radio channels. From there on it was hourly calls on top of the mandatory reporting points as the propeller turned its way through the 2,200 nm journey towards the next speck of dry land called Hawaii. The synthetic vision on the GPS was the by far the first to “see” that there was land coming up. As we received clearances into Hilo, we soon descended into lower cloud and ended up on the ILS approach over the ocean into the airport. I landed just at dusk, and Christiaan touched down just after night finally enveloped Hilo. We parked the planes and followed the same procedure as the two days previous, with dinner and bed on our minds. We were picked up the next day and returned to the airport to refuel the planes for the next leg. We also did a detailed post and pre-flight check on the aircraft, knowing the next time we’d see the planes would again be in the dark. Of course there were jokes of spending extra days on Hawaii, and while we were watching and tracking the weather we saw the need to delay the flight by one day to allow time to determine if some big storms on the way would start diminishing, or continue to grow and need to be avoided. On the third day, at 4:30 in the morning, we checked the weather again, and talked each other into believing that the storms we were looking at were slowly dissipating. One of the challenges, and areas of growth for us, was looking at weather that was some hours old and trying to predict what it would probably end up being 8–12 hours in the future. Having had a chat with Dylan the day previous, we were pretty sure that this flight should now be doable; so we again found ourselves picking up our IFR clearances in the dark of night and taking off with a fuel heavy airplane, flying out over the ocean straight into rain and low clouds. Air Traffic Control (ATC) was very helpful and gave us radar vectors to the best of their ability. As we climbed through 8,000 feet, ATC was able to give us unlimited radar vectors to get us on course as quickly as possible, leading us out of the weather. Just as that happened, I broke out of the clouds and was able to see the dawn break, with the volcano of Hilo standing out against the brightening sky. With the other Hawaiian Islands to our right it didn’t take too long before we again only had water all around us. 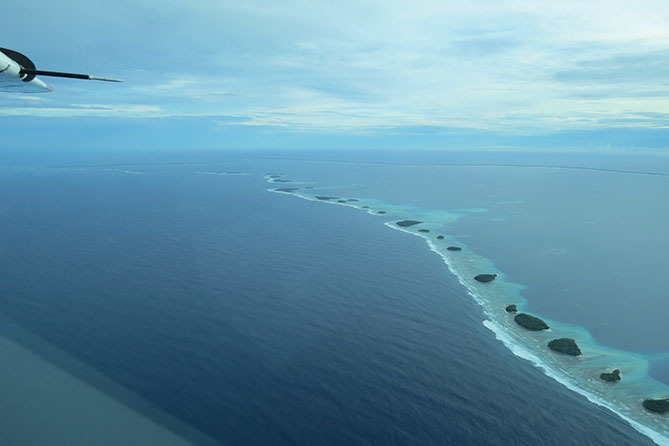 Thirteen hours and 2,200 nm later, with the sun low on the horizon, I spotted the first chain of outlying islands leading me towards Majuro, the capital of the Marshall Islands. The RNAV approach brought us down to the runway where I landed safely, though my flight tracker decided to indicate that I had landed in the bay. This was clarified about two hours later when we were in the hotel where we had wireless access again, and were able to confirm numerous queries that all was fine. We were warned that fuel was not available for five days due to a delay in the jet fuel shipment arriving by boat, but thankfully because FastAir had procured fuel releases in advance, these were honored and as soon as we shut down the planes, we were able to re-fuel for the final leg to Cairns. The next day we spent the morning walking around for several hours and were glad to step back from the heat and humidity back into the hotel air-conditioning. The rest of the day we spent watching the weather and filing flight plans for the last leg. We again departed in the early morning and arrived, after a long, slow drive in the dark, at the airport. We went through the usual checks and preparations and were able to pick up our IFR clearance. We were looking forward to this flight that would take us over the Solomon Islands. At various times during the 2,200 nm leg the weather was looking a bit dubious but, as we got nearer to these darker areas, we were able to navigate these storm systems without many problems, sometimes in the clear, sometimes in cloud. We knew that when we reached the Solomon Islands, which was about half way, the weather onwards ought to be clear- which it was. Due to the continuous headwinds this was our longest leg and, as we approached the 15 hour mark, I was able to witness a spectacular and beautiful sunset over the clouds looking eastward towards Australia. We were handed over from Brisbane Center to Cairns approach and, with the expected clearances, we gradually worked our way down into the clouds, and the spreading darkness, back towards firm ground. With broken clouds and decently high bases, I was soon flying down the ILS towards the now lit up runway. After landing and parking at the international terminal, it was fantastic to be met by the MAF Tree Tops Manager, Peter, who had all the necessary clearances and training to receive foreign aircraft. Immigration and Customs was a quick process and was all completed right next to the airplanes. From there we taxied over to general aviation and parked the airplanes for the duration of the night. 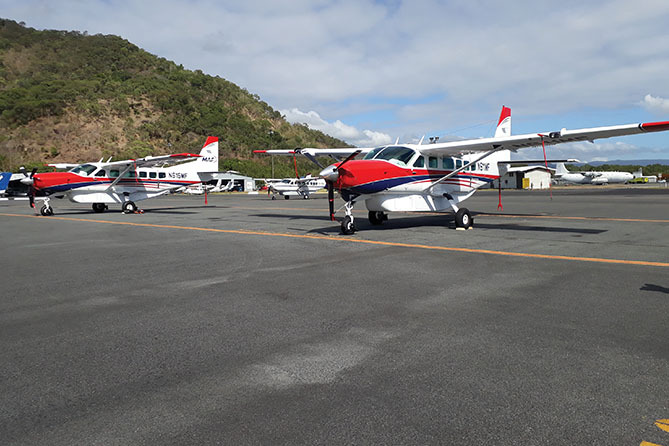 In the morning, it was only a quick 10 minute flight up to Mareeba where the planes were greeted by MAF staff who were happy to see the ‘hard facts’ of what had been talked about for quite some time. 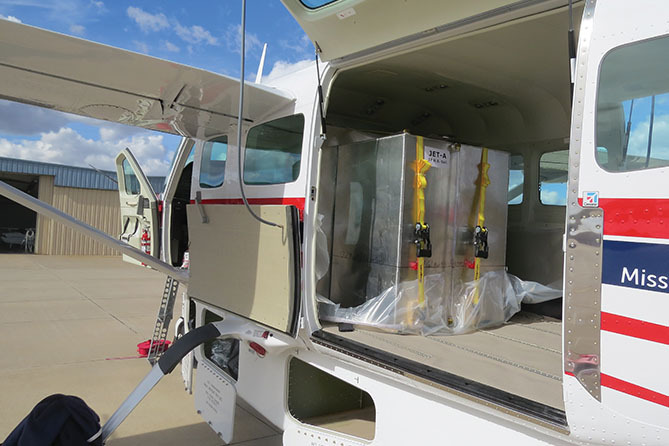 The planes are now in the hands of our engineers and avionics staff who will finalize the preparations before they are flown up to PNG where they will commence service with MAF! Photos & Story by Simon Wunderli.